Teaching America how to Letter: William Gordon, Ross George and the Story of the Speedball Textbook by Randall M. Hasson. Due to be released in 2018 by the Letterform Archive. As a result of the Speedball Textbook project, Randall was fortunate to find the archives of Ross F. George, inventor of the Speedball pen and author of The Speedball Textbook. Many original plates and source documentation has led to a comprehensive history of the show card industry, the invention of the pen, and a visual chronicle of lettering in America from 1915 to George’s death in 1960. The book is authored and the content designed by Randall in conjunction with the publishing team at The Letterform Archive. More information about Teaching America How to Letter can be found here. An in–depth interview with Randall covering the spiritual aspect of art by Lancia Smith; March 2016. 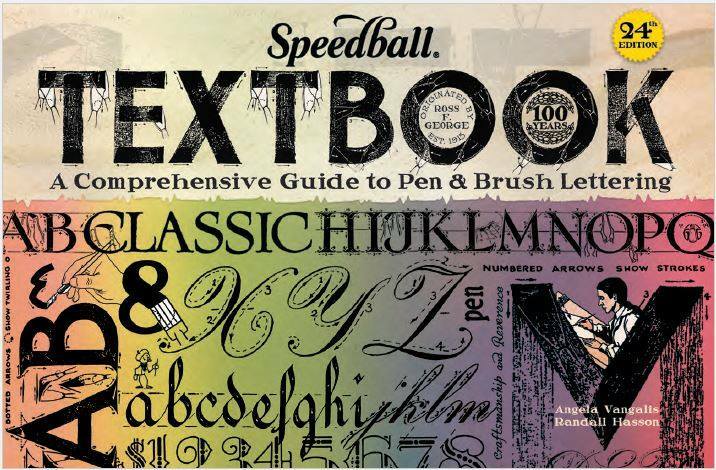 The only continuously published lettering textbook over a one-hundred year period. Lettering artists all over the world credit the Textbook as their first introduction to lettering. Randall was one of many Santa Fe Artists featured in the Collectors Guide Special Edition book. Click Here for his page. “Inviting The Presence”was used for the cover of “Praying for Israel’s Destiny” by Jim Goll. Pirates of the Caribbean Script! The DVD version was released in December, 2003. You can find the scenes by going to the 2nd DVD, and selecting “Below Decks”, and then “A Prisoner’s Tale”. My writing scenes are the intro to each of the historical segments. Carl Wilson’s website offers ‘Celebrate Calligraphy” ,a view of the lettereing arts community at the ‘Celebrations’ International Calligraphy Conference. Prominent Calligraphers Denis Brown, Harvest Crittendon, Georgia Deaver, Thomas Hoyer, Carl Rohrs, Shiela Waters, Diane Von Arx, Lisabet Wilson, Doug Boyd and myself all appear in the film. View a sample clip as well as ordering information.